Our Isaw Date at BF Almanza | Mommy Joys | Marriage, Motherhood, Life. The ordering system is like this: Upon arriving at the place, you'll be given a platter. This is where you'll put the sticks of barbecue/isaw/hotdog/adidas,etc. you're ordering. When you're done, they'll give you a small carton with a hand-written number. You have to wait for that number to be called so you'll know your order is ready. I'm pretty sure that by time they call you, you're already trembling in hunger. Hehe. So bear this in mind: go to Mang Raul's only if and when you're not famished, otherwise, I swear you're gonna pass out in hunger before you're served. =D And if you're maarte and can't live without airconditioning, Mang Raul's BBQ is not for you. There is no AC here, and it can really get hot inside. You can stay outside where there are tables and chairs too, but be prepared to draw in a mass of smoke. 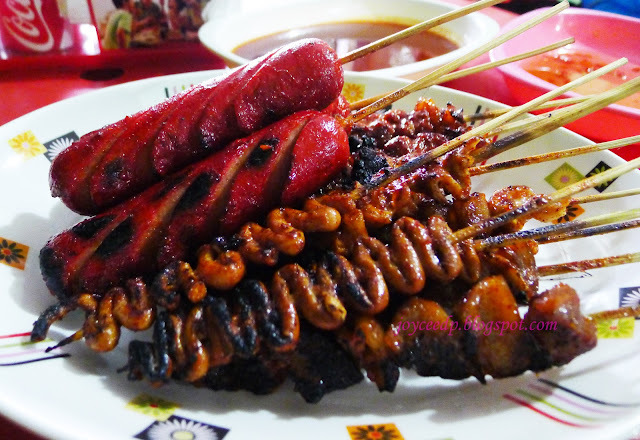 =D Kung hindi mo pa rin kaya, just send your yaya to get your isaw for you. Hmp. INSTAGRAMMED: Dito hindi na. =[ Tagaaaal kasi, I was already hungry.